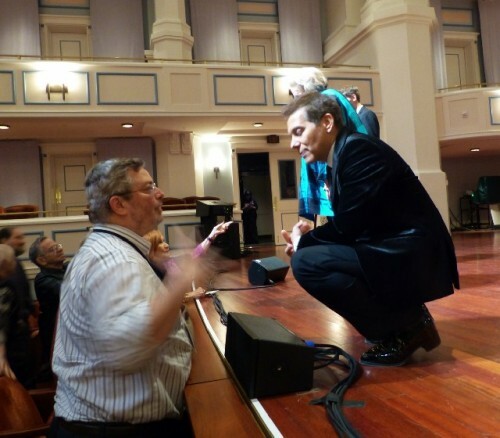 On stage in Carmel, Indiana. Sharing a love of the Great American Songbook. Discussing a question from the critics. 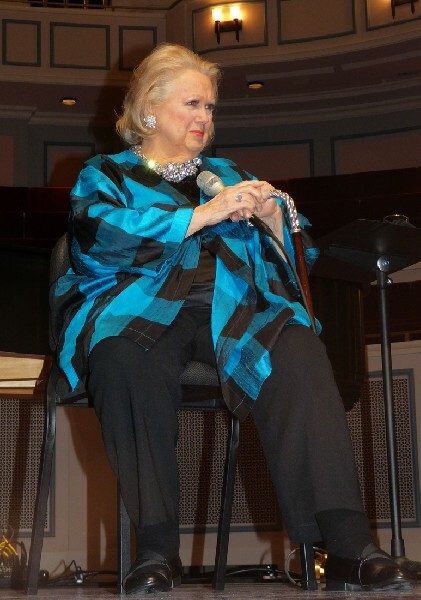 Cook discussed her limitations in reading music. Reflecting deeply for an answer. 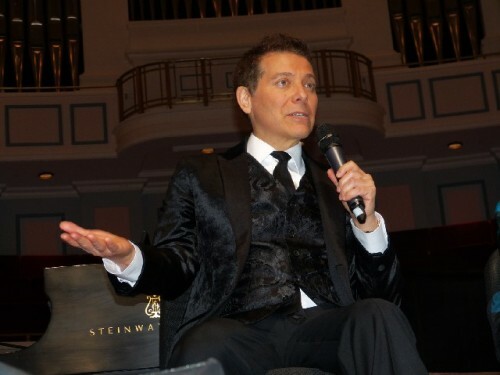 At home in Indiana where he is artistic director of the Performing Arts Center. A deep commitment to The American Songbook. Sharing fun stories about Liza. 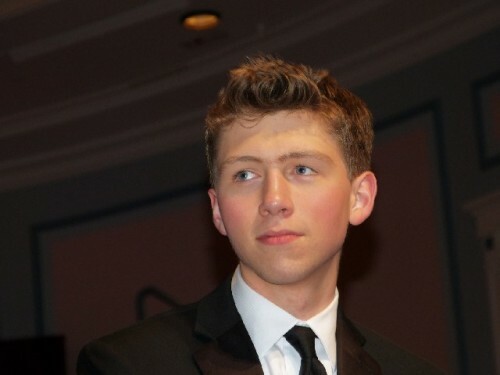 Nick Ziobro won the 2012 youth competition. Answering the question of a critic from Vegas. Last questions from the crirics. Last summer Liza took the train to Tanglewood with Feinstein. (Hillary Scott BSO photo). 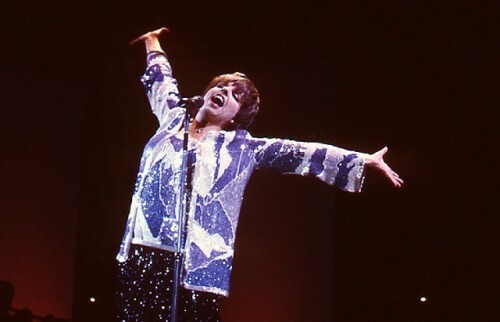 The always dynamic Liza. Giuliano photo. Great American Song indeed. Giuliano photo. 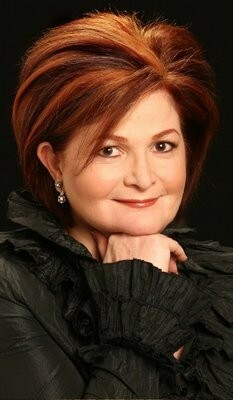 Faith Prince will appear with Feinstein this summer at Tanglewood. File photo. Smashing Megan Hilty is also coming to Lenox with Feinstein. File Photo. 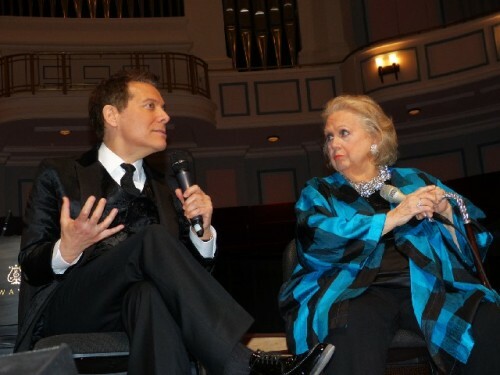 Following the performance in Carmel, Indiana the visiting group of the American Theatre Critics Association was led back into the auditorium for a meeting with Michael Feinstein and Barbara Cook. After some opening remarks, and a lengthy “appreciation” of Feinstein’s generosity from a New Orleans based critic, we picked up the thread of a dialogue that follows. It begins with Feinstein's response to a question about a now annual competition and $3,000 cash award for high school students. 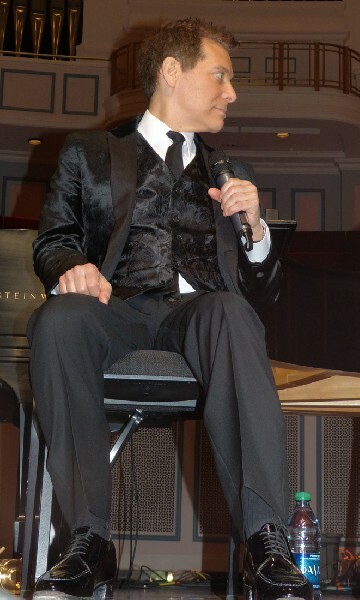 The 2012 winner Nick Ziobro, Youth Ambassador or the American Songbook, was on stage at Carmel for the first time since winning the award last year. 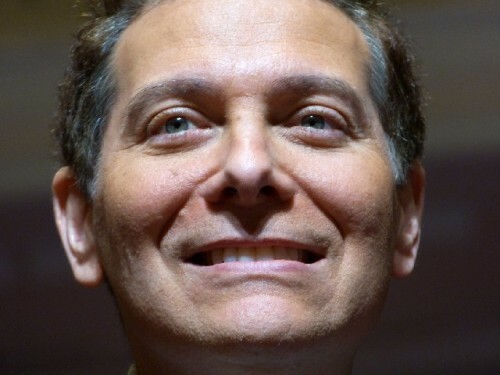 He has toured with Feinstein and appeared in his New York club. 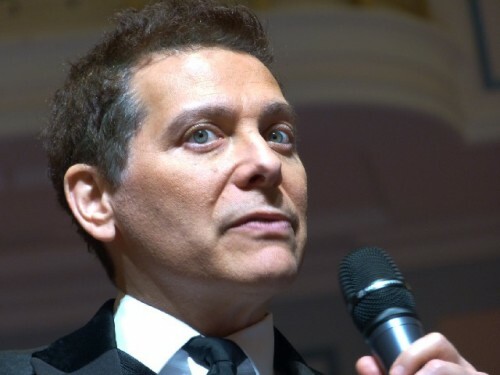 Michael Feinstein Through social media we find people who care about the American Songbook. Kids want to be a part of our competition because it’s anti American Idol which excludes them. There are thousands of kids everywhere who care about this music. A lot of young people who sing standards can’t get on American Idol because they demand that you do all this pyrotechnical stuff at the end which has nothing to do with the heart of the interpretation. It’s about a performance style which they require. It has nothing to do with the craft of the song. 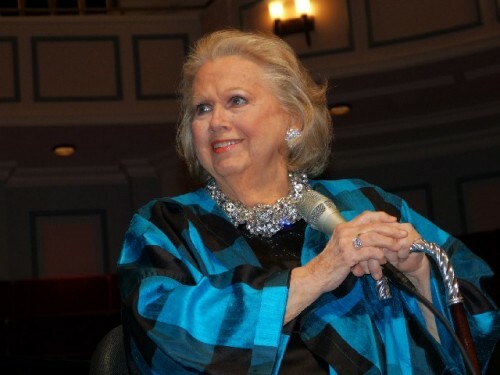 Barbara Cook They are hoping to get finalists into big recording contracts which is about money. MF It’s all about money. It’s about the producers of the show making a lot of money. BC I do think there are a lot of really talented people on that show. MF Who are being corrupted. Question With your contest do you have to tone them down a bit. To take that American Idol quality out of the performance? So they can find the lyrics and the truth of the song? MF The main thing we do in coaching and master classes is teaching everybody about connecting with the lyric. That informs how they sing the song. They may still do their pyrotechnic style but it is connected to the lyric. Then it’s ok. It means something. 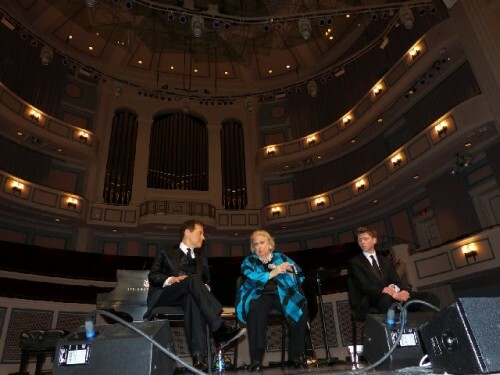 BC With young people in general (turning to the 2013 Youth Ambassador of the Great American Songbook, the 16-year-old prodigy, Nick Ziobro who joined the Q&A) except you of course. BC They are so concerned with singing that the only thing they have to say is “Look I can sing.” Who cares? A lot of people can sing. Who are you? What’s you life been like? Let me in. That’s what I always want to know. MF That’s so true. When we perform it’s ourselves our personalities. It’s who we are that people are interested in. BC People are drawn to authenticity. If young people, not you (looking at Ziobro) could understand what we really want is them. We want you. You are enough. You are always enough. That’s always true. Even though that seems to be what’s most frightening to people. Show people who you are. That’s terrifying for a lot of people. If you honestly show us your authentic self we are utterly involved. It’s one of the reasons why I think the arts are so important. Because we make that connection. The individual can connect with the artist. For that moment we are not so alone. That’s what’s so healing and important and necessary about really fine art. Charles Giuliano Barbara we had the great pleasure of seeing you on Broadway not long ago in Sondheim on Sondheim. After that you came to Tanglewood and performed in Ozawa Hall. Last summer Michael was at Tanglewood and you’re coming back this season. Can you talk about the magic of Tanglewood, your plans for this summer, and is there any chance that you can entice Barbara to come join you? 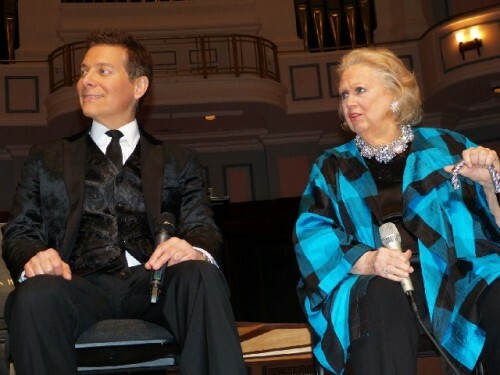 Is there any possibility of seeing the two of you together again at Tanglewood? BC I just love Ozawa Hall. MF I just assume you’re ready to play there again. You’ve appeared a number of times at Tanglewood. I don’t think there’s any problem with Barbara coming back. CG What can we expect this summer? CG You had wonderful guests artists last summer. Do you have more surprises up your sleeves for this summer? MF This summer my two guests will be Faith Prince (Tony winner and three time nominee) and Megan Hilty (Broadway actress and Ivy in the TV series Smash). Which we are very happy about. 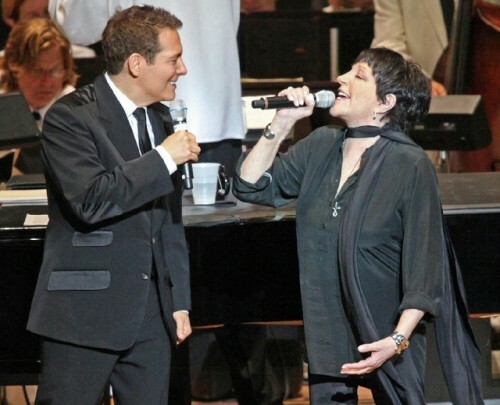 Last summer, completely spur of the moment, I called Liza Minnelli. Liza took the train and we went to the dining car. She said she was going to have lobster. It ended up being microwaved pizza. Literally, completely impromptu, she came on stage and sang “New York New York.” It was a great Tanglewood moment. So maybe I can get Barbara to take the train with me. Q We had a tour of the Great American Songbook archive. We would love to hear what it means to you and how it is run. The director talked about how some day she would like to see a separate building for it. What is so important about preserving all of this memorabilia? BC The work that Michael has done and will do is just extraordinary. He knows exactly what he’s doing. 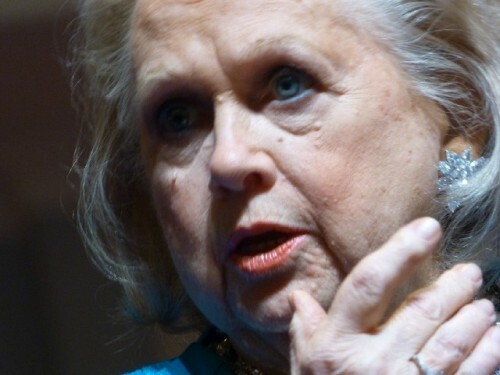 MF Thank you Barbara. What we want to do is build a museum here (Carmel, Indiana). To have the Great American Sonbook in a physical place. We have the Rock ‘n’ Roll Hall of Fame. The Country Music Hall of Fame. But there is no museum for the Great American Songbook. So what we are building here is an amazing archive. We have received Meredith Wilson’s (Music Man) and Henry Mancini’s from his widow and the list just goes on and on. Because people care so much about the legacy and they want to know what’s going to happen to their stuff. BC You’ve heard me tell the story about Stephen (Sondheim). BC Stephen Sondheim is a great admirer of the Gershwins and in particular Porgy and Bess. There was a brouhaha when they did that truncated version (American Repertory Theatre) and what Stephen did (a rant in the New York Times). 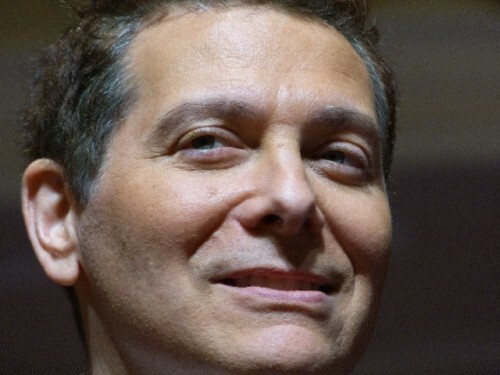 Some time ago he was at the Library of Congress and asked to be able to look at the original score of Porgy and Bess. Of course you put the gloves on and have to be very careful. He said that, as a composer, by the way the pen moved he knew when he (Gershwin) was having trouble and when it just flowed. It was fascinating for him. He found it very moving and he started to cry. His tears dropped onto the original score of Porgy and Bess. So, if you ever get to see the score, and there’s a blob there, it’s Stephen’s tears. That just knocks me out. BC Stephen cries very easily. Q Nick can you talk about the impact of winning the contest and being the Youth Ambassador or the American Songbook has had on you and your career. Are people your age (now 17 he won at 16) listening to this music? Nick Ziobro Are my friends listening to it? Well, they are now. Take Michael Bublé. He takes songs that Frank Sinatra used to sing he does the exact same arrangement and everything and people my age love it. But they don’t know that these songs were written fifty or sixty years ago. They don’t know how popular they were or how important they are. They enjoy it just as much as I do but I understand where it comes from. After the competition they were saying “Wow. What kind of stuff do you sing?” I talk about it and they say “That’s pretty interesting.” I tell them some of the stories that Michael has told me and they say “Cool. That’s pretty interesting.” Every once in awhile I show them a song in my IPod. It’s interesting how I get connected to the song. The music of the Great American Song book is important and deserves to last but it won’t last if people don’t listen to it. I’ll never forget what she said. “Honey, all you have to do is get them in their seats.” And that’s what it is. They don’t have any other judgment about it other than that they like it. The only issue of exposing young people to this music is that there is a fundamental change in concentration, attention span and exposure, which requires listening to a lyric in a way that a lot of young people don’t listen in the same way. Sometimes it takes a learning curve to say, yeah you’re listening to the beat but listen to the lyric. That can be challenging. With time people grow into it. It wears well with age. BC It’s astonishing to me how young people don’t investigate the lyric. That will help you with the notes. It’s weird that they don’t pay attention. With a phrase that’s difficult to sing, if you know what you’re talking about, you forget about the sound. For me it’s not important. Fred Astaire didn’t have a great voice but he was a great singer. Or Jimmy Durante. He could sing a tune and had a great sense of rhythm. Q I read somewhere and I may be dreaming that you (Barbara) have a limited ability to read music. How have you been able to develop a style when, as you say, you can’t read music very well. BC I may be wrong but sometimes I think that’s helped me. I know a very famous opera singer who tells me the way she remembers an aria is that she sees the page. As she’s singing she’s seeing the page. Well, I don’t think that’s the way to go for myself. I think a lot of people do that. I don’t know. I don’t know if I’m singing a high this or that or a low this or that. I don’t mean to put down how important it is to know music. I don’t. With Candide (Bernstein) I wish I knew how to read music then. Or Stephen’s (Sondheim) songs. 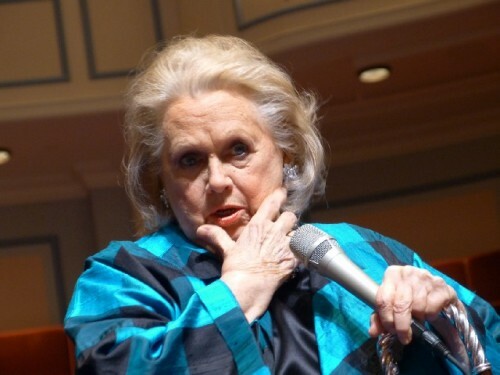 Most of the songs I sing from the Great American Songbook are not that complicated. I can get the melodies rather easily. Not with Stephen. He fools you all the time. He laughs at me all the time. Barbara… Through the years occasionally it would have been good but most of the time not. MF I just want to say that for people like us it is really important to have the allies of people who really understand what art is about and is propagated in such a way that brings more people to culture. We value so much what you do (critics) because sometimes you interpret what we do in such a way that makes it accessible to people who otherwise never come to us. For that we are extraordinarily grateful to all of you. So thank you very much.